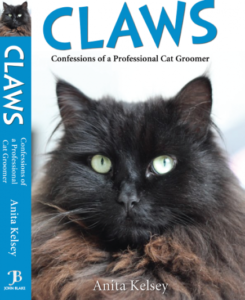 Debut cat book, CLAWS: Confessions of a Professional Cat Groomer is out now! Throughout her years visiting people's homes as a cat groomer, Anita Kelsey has amassed a vast array of funny, cute and ridiculous stories about cats and, of course, their owners. 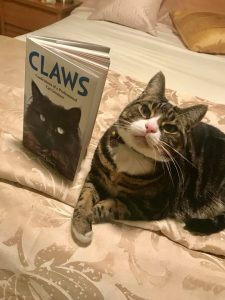 In CLAWS, she picks out just a few of her favourite tales to share with the reader from, 'Sammy the Swooner' to 'Tubbs: The Fat Cat Caught in His Flap'. CLAWS is a must-have book for all cat lovers by an author drawing on a lifetime of living with and professionally caring for cats in their various guises and eccentricities. In the pages of Anita Kelsey's entertaining and heart warming book, you'll meet twenty of the most characterful cats, all eventually calmed and preened to their natural beauty and animal magnificence by the author. 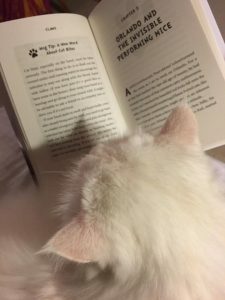 Meet their owners, too, and enjoy Anita's take on the individual relationships between pet and owner. "The image of a typical cat groomer is one of an aproned individual, armed with combs and clippers and a compliant kitty on the table. Talk to Anita Kelsey and you’ll learn that nothing is further from the truth. And she has the scars to prove it. There are so many TV programmes throwing light on what it’s like to do various jobs and professions;doctors,lawyers train drivers, vets and journalists included. These programmes have even been shown to influence teenagers’s career choices. 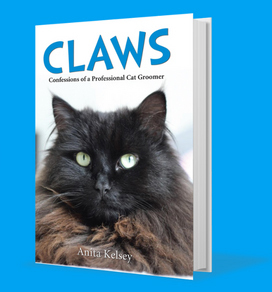 Now there hasn’t been a programme about cat grooming yet (to my knowledge) but there is now a book by London based Professional Cat Groomer and Cat Behaviourist, Anita Kelsey. LISTEN LIVE TO AN INTERVIEW ON US PET LIFE RADIO. CLICK AUDIO ON THE WEBSITE. Anita Kelsey holds a first class honours degree in Feline Behaviour and Psychology (work-based BA Hons) and runs a vet-referred service dedicated to the diagnosis and treatment of behaviour problems in cats. She is also a cat groomer with master level certification and is known for her work with aggressive or phobic cats during the grooming process. Anita is an advocate for holistic gentle handling during grooming with a strong emphasis on educating clients. She is a full member of The Canine & Feline Behaviour Association. Anita is also a columnist for Your Cat Magazine and is on their experts panel giving advice on behaviour and grooming. CLAWS is Anita’s first book.